As a person who once owned three dogs (when I was living with my parents; thanks to apartment life, I now have 2 beautiful, wonderful cats that may actually come from the Moon), it’s not hard to see why people love dogs. They’re just lovable masses of fur and fun, they’re sad to see you go, happy to see you home, but no matter where they end up in the world, they’re all about a good time. I still remember one of my boys, Ziggy, I called him (since I was listening to Bob Marley for some reason), a half Shih Tzu, half Lhasa Apso that hung out with me for eight glorious years. We’ve conquered so many games together, we’ve got the same political leanings (he seems to growl at a lot of politicians), he’s a confirmed fan of Arsenal Football Club, and he loves barking at seagulls. Predictably, they respond in kind, often by getting their boys together then making a beeline towards poor, unfortunate Ziggy, who would then dive under the car. I love that little wuss. Anyway, the reason why dogs seem to be appealing is that they are considered hypersocial with humans – they really like us and are deeply integrated with our lives the moment we bring them into our lives and homes. It’s been documented throughout history and folklore to the point that dogs are a byword for loyalty. The thing is that we can only view this relationship through human eyes. 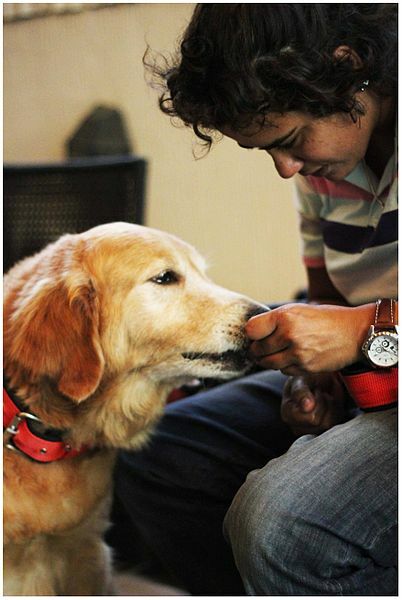 How about through the dog’s eyes – what is going on in the dog’s mind when it comes to the human-canine relationship? A team of cognitive psychologists have an article that’s about to be published in Social Cognitive and Affective Neuroscience that looks into just that. They’re not mind-readers, but at least they can use an fMRI to see what’s firing in the dog’s brain, much like a recent study did with teenagers. Why study dogs’ preference for food or friendship, apart from the squee factor? The authors’ literature search (all good researchers know that before you even try anything in the lab, do your reading first) turned up some interesting stuff, such as how dogs treat their owners as a means of acquiring food. I can sense some of you are getting nervous because you’re suddenly thinking about your parents, but anyway – those observations make sense if you think about how often we use food in their training. Sit. Roll over. Beg. Play dead. Attack sibling. Good dog. Treat. However, these observations can be inconsistent. The authors cite studies in which dogs sometimes pick food, sometimes pick the owner. They suspect this comes down to how the experiment was carried out, and if there’s anything to be learned in scientific experiments (apart from get it in writing) is that all strong results can be replicated. A lot of studies are in trouble because of this. This paper highlights three experiments carried out by the authors. The first experiment required hooking up 15 awake, unrestrained dogs to an fMRI (no surgery involved, relax) to see how their brains light up when looking at objects associated with food as a reward or praise as a reward. The second study would attempt to confirm just how much praise actually matters (vs. no praise at all), and the third looks at their behavior, no fMRI, but giving their dogs a choice between running towards praise (the owner) or food (Pupperoni). We will return you to sciencing in a little bit, but first: puppies. So what did they learn? Before we go any further, I will stay away from neurobiology on this (if only because I am not good with it – I’m a chemist, remember). What they suggest through the results of all of three studies is that even though some dogs have a preference for praise over food and vice versa, it is “consistent.” By that it means that dogs who strongly prefer food will have a greater response to food as a reward, and dogs who strongly prefer praise will have a greater response to praise as a reward. The authors also suggest that some dogs are equally stimulated by either one, so they’re going to “show high behavioral variability” when presented with food or praise. They even go so far to suggest that tests like this could be useful for certain service dogs. Dogs who are people-persons (people-dogs?) may be better for jobs that require being around a lot of people, like a therapy dog. Meanwhile, dogs who prefer food may be better for jobs that are more independent, like search-and-rescue. Let’s face it, though – dog owners are probably still going to both rewards because they’re hopelessly mushy. I know I was. So I guess our dogs really do like us, not just because we give them food (and we well better, too) but because they just want to be with us. It’s nice to feel appreciated sometimes, and our dogs can provide that social structure for us just as we can do for them. It’s a sobering thought that some people might be taking this for granted, not just from our dogs, but from other people as well. It really may be just one of those things that dog owners, maybe pet owners in general, just have a better understanding of since they have a reminder every single day of what it means to be appreciated, maybe even loved by another thinking, feeling, living being. Previous Jonny’s got a Liebster! I did a search recently on most affectionate cats. A whole bunch of websites pop up, mostly having the annoying feature of having to click through each picture to see the list (dear web, stop that!). I found this site this morning: http://cats.petbreeds.com/d/d/Affectionate – it doesn’t require click-throughs and has ratings. My reason for this? About 11 years ago I adopted the friendliest cat I’ve ever been around. She plays retrieve. She obeys “sit” (well, most of the time – I’m sure she understands even when she doesn’t obey). She is very into being with me – and yes, I get that I am a big, breathing heating pad but just watching her dissolve into sleep on my lap or in my armpit (a habit less appropriate than it was to her kitten-self) is touching beyond words. I currently have 6 dogs and 2 cats hahaha. They all want attention and they are one of the thigs that make me happy and comfort me when I’m sad. Hi! I really enjoyed reading this. I have to admit that I am more of a cat person than a dog person. Some people don’t think that cats can learn tricks or show emotions, but I have a few cats that prove that wrong. Back to the dogs, they are pretty much like people, especially kids. As much as kids like to get rewards, what they want the most is praise from their parents or other adults when they do the right thing! I own cats myself, and I completely agree. One of my cats responds to her own name – and they’re stereotyped as not being able to do that. That’ll show the nay-sayers. I absolutely love dogs, a very comforting animal! !